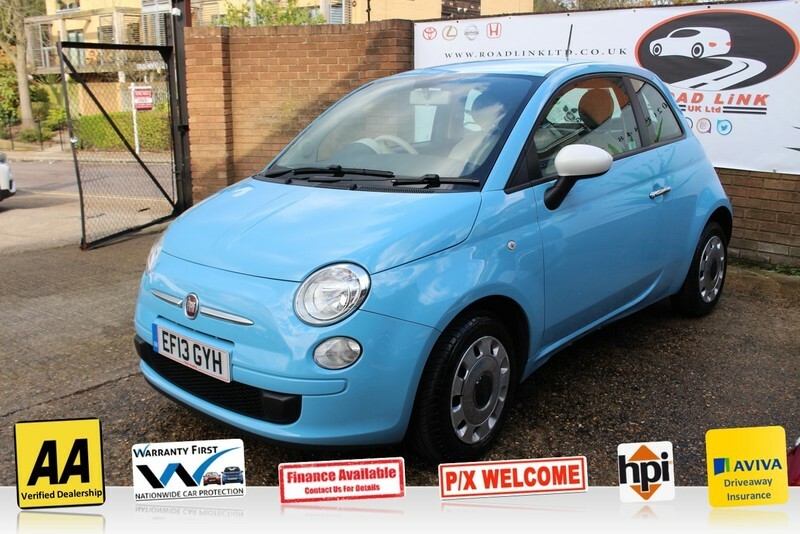 Fiat 500 1.2 COLOUR THERAPY 2013 - If ever a car has built its brand, it's this one, Fiat's 500. Its interior has got a lot to offer especially when it comes to storage. You'll find a usefully deep shelf ahead of the passenger, a small pop-out cubby on the driver's side of the center console and the usual door bins and cup holders. Even the passenger seat cushion tips forward to reveal an oddments compartment. Annual tax costs only £30.00. 15'' Alloy Wheels, Air Conditioning with Cabin air filter, TOMTOM Navigation with Blue&Me, Bluetooth and CD/MP3 Player, Start/Stop System, Day/night Rear View Mirror, Electric Windows and Mirrors, Power Assisted Steering, Adjustable Steering, ABS, Body Coloured Bumpers, Brake Assist, ISOFix Anchor Point for quick and easy installation of Child Seat, Privacy/Tinted Glass, Safety Belts, Safety Belts Rear, Side Impact Airbags, Free buying experience where you can drive away the same day. All our cars come with 1-year AA breakdown cover, HPI clear certificate and 3 months warranty, part-exchange welcome, finance available at best rate. We also offer 5 days drive-away insurance. At Road Link ltd we ensure that all of our vehicles are inspected and in great working condition. If you have any queries please contact us on 0208 848 3221 / 077 5666 5666 or via E-Mail.